On Saturday May 31, 2014, I visited Wishing Well Sanctuary near Toronto, Ontario (Canada) along with my mother, Franceen Neufeld, to take part in an author’s panel. The sanctuary was founded in 2012 by the lovely Brenda Bronfman, a powerhouse of compassion. 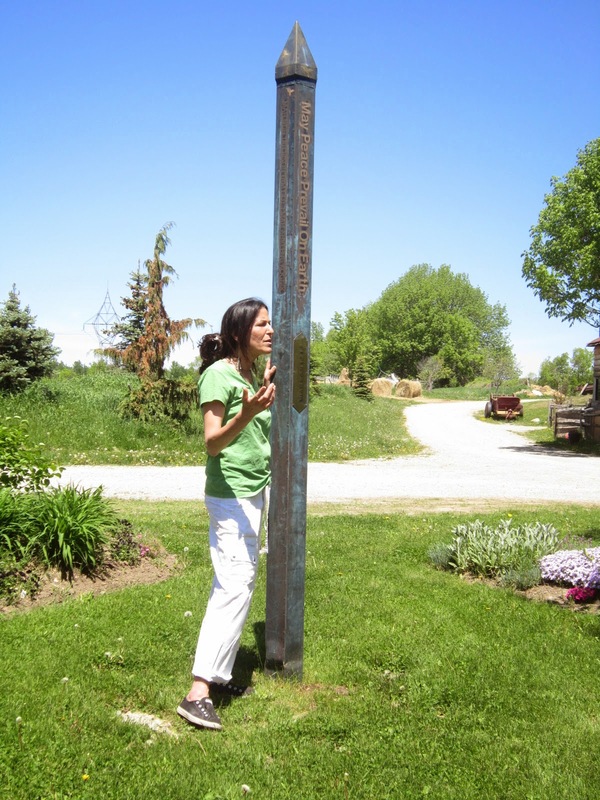 Wishing Well’s motto is May Peace Prevail On Earth, which is inscribed on a peace pole in Braille, English, French, Ojibway, Sanskrit, Hebrew and paw prints (“we are all connected!”). Wishing Well Sanctuary is always in need of donations to continue their work. Visit www.wishingwellsanctuary.org. My mother Franceen and I arrive at Wishing Well Sanctuary at noon in good spirits, eager to experience the day ahead. 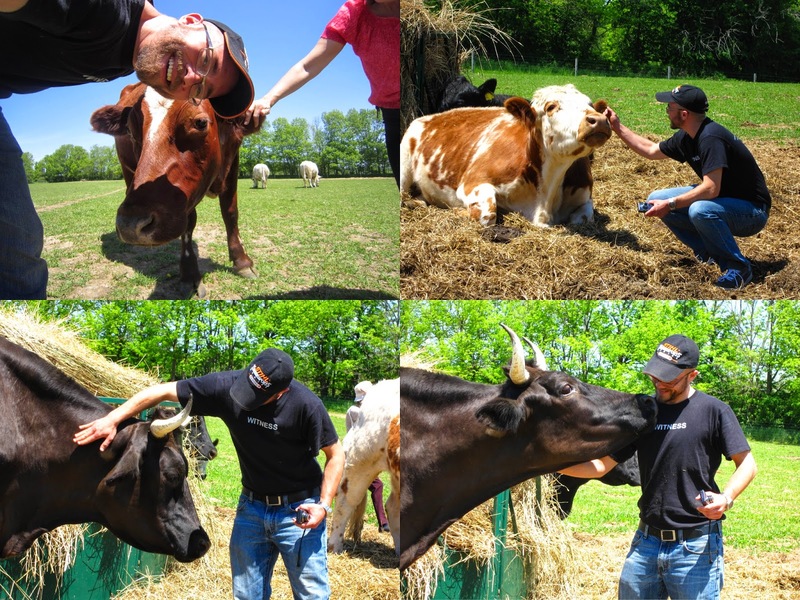 The occasion marks my mom’s first time visiting a farmed animal sanctuary, and my second (read about my Visit to Big Sky Ranch Animal Sanctuary). It is a gorgeous day, reflecting the mood of everyone here. The first person we meet is a volunteer, a woman about my mother’s age, who smiles broadly as she greets us. I introduce myself and my mother – then her jaw drops in surprise and delight. The volunteer stares at my mother for half a second in disbelief, then her hands reach forward to take my mother’s. “Franceen!” she says, “I can’t believe I’m meeting you!” She goes on to explain that she has started reading Suffering Eyes, at which she and my mother sink effortlessly into what I know will be a deep and not brief conversation. Small-talk-less. Heartfelt. Healing. Probably with a hug or two before it’s through. So I walk on – don’t want to distract from a good thing. The next person I see is Brenda Bronfman, who greets me with equal warmth. She is dressed in white capris or folded up pants and a green shirt, the picture of comfort and ease. She has deep dark hair, deep dark eyes, and a smile that has an aura of its own. It is a smile that radiates energy, I can’t think how else to describe it. I feel more powerful in her presence, as though she has energy to share, free for the taking, so I soak it up as we hug hello. At 12:30 the sanctuary tour begins (a sanctuary tour is offered at Wishing Well on the last Saturday of every month at 12:30). Brenda rounds up the crowd that has gathered, some 40 or 50 people, and begins the tour with an introduction to Wishing Well Sanctuary, its mission, its volunteers, its animal residents. She explains what a farmed animal sanctuary is and why we say “farmed animals” instead of “farm animals,” and “animals used for food” instead of “food animals.” “As if ‘farm animal’ or ‘food animal’ is what the animal is rather than what we make it,” she says. There is no such thing as a farm animal, there are only animals that are farmed by us. As the tour begins, first with a visit to the chicken and rooster coop, then on to the pigs and goats, rabbits, sheep, cows and horses, Brenda reminds us throughout that each animal here is an individual. She tells us their names, their stories. The many pigs who arrived here after falling off trucks headed for slaughter, something that happens alarmingly often. They are bittersweet stories. Taking joy in a pig falling from a truck. That is the bittersweet world of sanctuary – no joy comes unburdened with the grief of awareness. What would have happened to these pigs had they not fallen. What happened to all the other pigs unlucky enough not to fall. What happened to the other pigs who fell – there must be many! – but who were never found, never rescued, or who simply didn’t survive their fall. For every one that arrives here, how many more unknown and unnumbered. But the grief and the joy – as my mother describes in her talk – do not cancel each other out or diminish each other. Here there is joy and my mother and I enjoy it, meeting and greeting the individuals who call Wishing Well home. My mother meeting Cuddles. Named for his behaviour. Bundle of love. Meeting a pot bellied pig. I have three pugs at home, two of which are black. How can such resemblance exist between such foreign species? They look the same, they act the same, they even love the same things – snorting, sticking their noses into everything, food (from the look of their bellies), and belly rubs. I started rubbing this pig’s belly, she let out a big piggy grunt-squeal and flopped over to give me full access. Pugs and pigs definitely speak the same language. On to the cows. Gentlest giants. If any one of them had had a beef with me, she (or he) could have taken me out in a heartbeat. We humans are puny. Soft. Hornless. Clawless. Goofy-toothed. And we think we’re so special. What makes us superior? Having brains that can think up the kind of unthinking violence that we inflict on animals? A kind of violence that would never even occur to these cows. Even though the cows here would have more than enough cause to distrust and detest humans, and even though any one of them could crush or gore me without burning a calorie, the cows trust me. I feel safe among them (though cautious, especially with the horns, a humbling encounter). And it is only now, at this moment, writing this story, that I realize I should have been more penitent in the face of their trust. “I have eaten you,” should have been in my heart. Recently my mother has been thinking a lot about graciousness. In speaking to parents struggling to accept a child who is gay or trans, she points out that while parents often think that they’re the ones being gracious as they undertake a long and painful journey towards acceptance, in reality it is their child – the one waiting patiently and lovingly and faithfully for their parents to wrap their heads around a simple truth – who is being gracious. She makes a good point. It is the same with sanctuaries. It is easy to think of sanctuaries as humans being gracious to animals. It is the other way around. All around me, here at Wishing Well, animals are teaching me the meaning of graciousness.